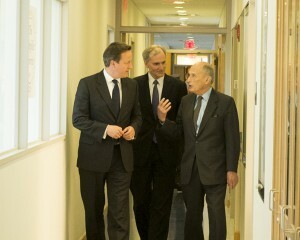 On Wednesday, May 15, 2013, British Prime Minister David Cameron visited The Rockefeller University where he met with President Marc Tessier-Lavigne, Nobel laureate Paul Greengard, and other scientists working on Alzheimer’s disease and related neurodegenerative conditions. The Prime Minister was accompanied by George Freeman, Member of Parliament and Adviser to the UK Government on Life Sciences; Tim Luke, a Senior Adviser on Business, Trade and Innovation; and Danny Lopez, the British Consul General in New York. The visit grew out of the Prime Minister’s deep interest in research on dementia. Last year, he launched the Prime Minister’s Challenge on Dementia, his Government’s commitment to dramatically speed up how dementia diagnosis and therapy are approached and how research is conducted. On the same day as Mr. Cameron’s visit to Rockefeller University, the UK Government announced that it will use its Presidency of the G8 this year to identify and agree on an international approach to dementia research, in recognition that the condition is fast becoming the biggest pressure on health care systems around the world. Mr. Cameron’s visit to Rockefeller began with a private meeting in Welch Hall with New York-area biotechnology and pharmaceutical executives, after which President Tessier-Lavigne escorted the Prime Minister to his neuroscience lab, the Laboratory of Brain Development and Repair. Mr. Cameron met three young members of the lab—Drs. Cynthia Duggan, Olav Olsen, and Dominik Paquet—who are studying the molecular mechanisms that underlie the degeneration of axons, the slender fibers projecting from nerve cells that link one neuron to another. Earlier in the day, UK Life Sciences Adviser George Freeman discussed possible collaborative ventures with Dr. Barry S. Coller, Physician in Chief of The Rockefeller University Hospital, David Rockefeller Professor, and head of the Allen and Frances Adler Laboratory of Blood and Vascular Biology. The Rockefeller University has many connections with the UK. President Tessier-Lavigne, a former Rhodes Scholar who conducted postdoctoral research at University College London, is one of seven Rockefeller scientists who are Fellows of the Royal Society. Sir Paul Nurse, President of the Royal Society and Director of London’s new Francis Crick Institute, is a Rockefeller professor and the University’s immediate past president. Source: The Rockefeller University, Press Release, May 17, 2013.